Dar es Salaam (from Arabic: دار السلام‎‎ Dār as-Salām, "the place of peace"; formerly Mzizima) is the largest city in Tanzania and one of the largest cities in East Africa by population, as well as a regionally important economic centre. Located on the Indian Ocean coast, the city is one of the fastest growing in the world. Until 1974, Dar es Salaam served as Tanzania’s capital city, at which point the capital city commenced transferring to Dodoma, which was officially completed in 1996. However, as of 2017, it continues to remain a focus of central government bureaucracy, although this is in the process of fully moving to Dodoma. In addition, it is Tanzania's most prominent city in arts, fashion, media, music, film and television and a leading financial centre, with the Dar es Salaam Stock Exchange (DSE) being the country's first and most important stock exchange market. 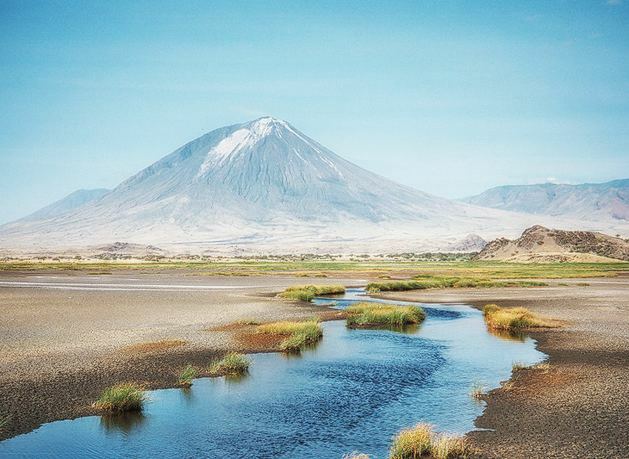 The city is the leading arrival and departure point for most tourists who visit Tanzania, including the national parks for safaris and the islands of Unguja and Pemba. 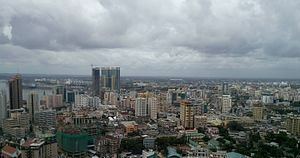 Dar es Salaam is also the largest and most populous Swahili-speaking city in the world. It is the capital of the coextensive Dar es Salaam Region administrative province, which is one of Tanzania's 31 administrative regions, and consists of five districts: Kinondoni in the north, Ilala in the centre, Ubungo, Temeke in the south and Kigamboni. The region had a population of 4,364,541 as of the official 2012 census. In the 19th century, Mzizima (Kiswahili for "healthy town") was a coastal fishing village on the periphery of Indian Ocean trade routes. In 1865 or 1866, Sultan Majid bin Said of Zanzibar began building a new city very close to Mzizima and named it Dar es Salaam. The name is commonly translated as "abode/home of peace", based on the Arabic dar ("house"), and the Arabic es salaam ("of peace"). Dar es Salaam fell into decline after Majid's death in 1870, but was revived in 1887 when the German East Africa Company established a station there. The town's growth was facilitated by its role as the administrative and commercial centre of German East Africa and industrial expansion resulting from the construction of the Central Railway Line in the early 1900s. German East Africa was captured by the British during World War I and became Tanganyika, with Dar es Salaam the administrative and commercial centre. Under British indirect rule, separate European (e.g., Oyster Bay) and African (e.g., Kariakoo and Ilala) areas developed at a distance from the city centre. The city's population also included a large number of south Asians. After World War II, Dar es Salaam experienced a period of rapid growth. In 1967, the Tanzanian government declared the Ujamaa policy, that set Tanzania into a socialist path. The move slowed down the potential growth of the city as the government encouraged people not to move in cities but stay in Ujamaa socialist villages. But by 1980's the Ujamaa policy proved to be a failure into combating increasing poverty, hunger, and delayed development that Tanzania faced. This led to the 1980s liberalization policy that virtually ended socialism and its spirit within the Tanzania's government. The move led to increasing migration of rural dwellers from rural areas into cities with Dar es Salaam becoming the leading city in receiving migrants from rural areas. Until the late 1990s, Dar es Salaam was not put into the same category as Africa's leading cities like Nairobi, Johannesburg, Lagos, or Addis Ababa. But the 2000s decade became the turning point as the city experienced one of Africa's fastest urbanization rates as businesses were opened and prospered, Tanzanian banks headquartered in the city started to run more proper, the Dar es Salaam Stock Exchange expanded, and the Dar es Salaam harbour proved to be the most important in Tanzania and prominent for entrepot trade with landlocked countries like the Democratic Republic of Congo, Rwanda, Burundi, and Zambia. The CBD skyline hosts tall buildings, among them the 35-floor PSPF Tower, finished in 2015, and the Tanzania Ports Authority (TPA) Tower, currently under construction . Dar es Salaam is located at 6°48' South, 39°17' East (−6.8000, 39.2833), on a natural harbour on the eastern coast of Africa, with sandy beaches in some areas. The region of Dar es Salaam is divied in five districts. Dar es Salaam is the largest city in Tanzania. With a population increase of 5.6 percent per year from 2002 to 2012, the city is the third fastest growing in Africa (ninth fastest in the world), after Bamako and Lagos. The metro population is expected to reach 5.12 million by 2020 and predicted to be as high as 76 million by the year 2100, making Dar Es Salaam the second largest city on earth (after Lagos), by 2100. According to the 2012 national census, the region had a population of 4,364,541, which was much higher than the pre-census projection of 3,270,255. For 2002–2012, the region's 5.6 percent average annual population growth rate was the highest in the country. It was also the most densely populated region with 3,133 people per square kilometer. Dar es Salaam is Tanzania's most important city for both business and government. The city contains high concentrations of trade and other services and manufacturing compared to other parts of Tanzania, which has about 80 percent of its population in rural areas. Downtown includes small businesses, many of which are run by traders and proprietors whose families originated from the Middle East and Indian sub-continent—areas of the world with which the settlements of the Tanzanian coast have had long-standing trading relations. 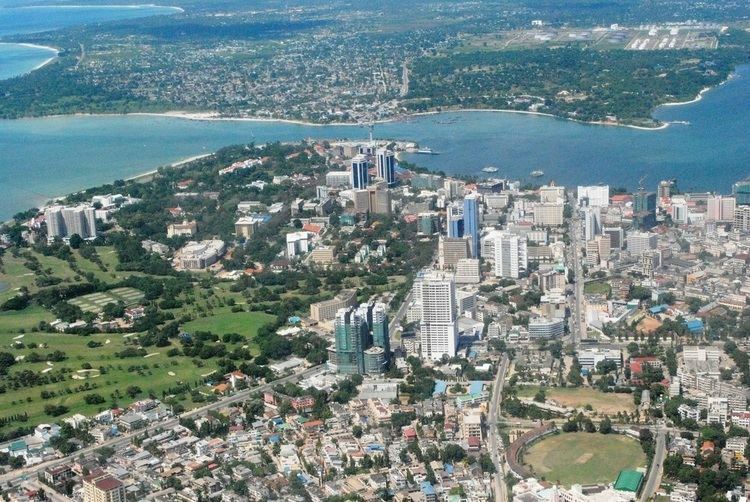 The Dar es Salaam CBD made up of Kisutu, Kivukoni, Upanga and Kariakoo areas is Tanzania's largest city CBD. All three areas making up the downtown are found in the Ilala district. Kivukoni has the city's important fish market, the Magogoni fish market. Kivukoni also is the place where the Tanzania's central bank, The Bank of Tanzania is located, so is the Dar es Salaam Stock Exchange. Kisutu has businesses and offices and is the location of Dar es Salaam central railway station, the PSPF Towers and the TPA tower. Kariakoo is the prominent shopping area with streets like Congo Street for clothing shops. Uhuru street is for computer and electronics, Msimbazi for mobile phones. On a natural harbour on the Indian Ocean, it is the hub of the Tanzanian transportation system as the main railways and several highways originate in or near the city. Dar es Salaam has had a major construction boom. The PSPF Twin Towers with more than 35 stories is the tallest building in the city and the country. Dar es Salaam has major infrastructural problems, including an outdated transport system and occasional power rationing. "In 1949 the town became a municipality...[with] four nominated town councillors who elected a mayor." "Until June 1996, Dar es Salaam was managed by the Dar es Salaam City Council...the highest policymaking body in the city." As of 2017 Paul Makonda serves as commissioner of Dar es Salaam Region. The most common form of transport in Dar es Salaam are the public buses, called dala dala, which are often found at the major bus terminals of Makumbusho and Ubungo. Dala dalas are cheap and often overcrowded. They are operated by a driver and a conductor: the conductor collects the fare and signals the driver to leave. They tend to be overcrowded, with passengers sometimes hanging outside the door.Since the introduction of motorcycle transit business known as "Bodaboda", most of the people prefer this type of transportation which allows them to get into the city faster compared to the minibuses which face a lot of traffic. Dala dala minibuses are involved in many road accidents, accounting for a large percentage of the 4000+ yearly road deaths. The government has been introducing a bus rapid transport or metro bus system under Dar es Salaam rapid transit ('mwendo kasi') flagship. The metro buses are managed by UDA (Usafiri Dar es Salaam). The bus rapid transit system Phase 1 is completed and already in operation by the Dar Rapid Transit Agency, a government-private sector entity, and began operation on 10 May 2016. It is branded as UDA-RT (Usafiri Dar-Es-Salaam Rapid Transit). The first section runs between Kimara in the northwest to Kivukoni on the northern headland of the harbour. Phase 1 was funded by the World Bank, African Development Bank and the Tanzanian government. The Dar es Salaam commuter rail is an urban and suburban commuter rail network serving the commercial city of Dar es Salaam. MV Kigamboni ferries are running between Kivukoni and Kigamboni in Dar es Salaam. Further types of transport are motorcycles and Bajaj. The city also hosts the head office of Tanzania Zambia Railways Authority (TAZARA) built in the late 1960s to early 1970s. Also it host the offices and infrastructures of the Central Railway Line (Operated by Tanzania Railways Authority, TRL) both railways are used to commute within the city during the day to ease traffic congestion in the already overcrowded roads. Tanzania Railways operates the Central Line from Dar es Salaam to Kigoma. The TAZARA Railway connects Dar es Salaam to Zambia. The Julius Nyerere International Airport is the principal airport serving the country with two operating terminals and one under construction; Terminal Three at Kipawa in Ilala Municipality. The city has the country's busiest port: The Port of Dar es Salaam handles 90% of the country's cargo. Due to huge influx of cargo and the slow pace of expansion a new cargo port 60 kilometres (37 miles) north of Dar es Salaam is proposed at Bagamoyo. Dar es Salaam has heavy traffic during the daytime, but after sunset the area is relatively quiet as much of the city's nightlife is located in more residential districts away from the city's mainly commercial centre. Due in part to the growth of the expatriate community and the increasing importance of tourism, the number of international restaurants has risen rapidly. The city offers a diversity of cuisine, ranging from traditional Tanzanian Barbecue-style options, such as Nyama Choma (Roasted meat—served with rice or ugali) and Mishkaki (Shish kebab—usually barbecued and served with salt, hot chili peppers, chapati, fries, and rice on the side), as well as the long-established traditional Indian and Zanzibari cuisine, to options from all corners of the globe, including Arab, Chinese, Thai, Turkish, Italian, and Japanese food. People who prefer neither fast food nor traditional restaurants buy their food from street vendors, who usually sell food at low prices. Samosas (sambusas) are common street food items within the city, as the area is largely influenced by the foods brought from India. In the 1970s, the Ministry of National Youth Culture aimed to create a national culture, which stressed the importance of music. Dar es Salaam became the music center in Tanzania, with the local radio exposing new bands and dominating the music and cultural scene. With this ujamaa, or family, mentality governing culture and music a unified people’s culture was created, leading to the rise of hip hop music. Throughout the years, the radio in Dar es Salaam has played a major role in the dissemination of music because many people don’t have television and cassettes are used over CDs. Further leisure spots are Mlimani shopping mall. Dar es Salaam boasts of luxury hotels and beaches, some of the major hotels include the Movenpick, Kempinski Kilimanjaro, Peacock, Whitesands and many more. Dar es Salaam (and specifically the area of Oyster Bay) is home to the Tingatinga painting style. The Tingatinga art is a form of oil painting that utilizes bright colors and hues found in nature which can be done in person. As a tourist, any thing or animal that you may have interest in, for example the Twiga (or Zebra) can be painted on a compressed-wood like canvas and can be used as a souvenir. Your name can also be customized on the wood as a wall hanging. The Nyumba ya sanaa ("House of Art") is a cultural centre, workshop and shop dedicated to Tanzanian art, showcasing and promoting Tanzanian craftmanship. Prominent Tanzanian sculptor George Lilanga has donated some of his works to the centre, including decorations of the building's main entrance. The National Stadium hosts Dar es Salaam's Young Africans Football Club, Simba Sports Club, Azam F.C. and other Tanzanian football clubs, and international matches. There is a proposal to build a new stadium in Dodoma, much bigger in capacity than the present one in Dar es salaam by the government as a donation from the Moroccan Kingdom. Dar has newspapers available, particularly from sellers prowling through stationary traffic at road intersections. English-language ones, with online presences, include The Citizen and The Guardian and the leading Kiswahili daily, Mwananchi.Business Times is the only financial and economic newspaper in town. It was established in 1988 and became the first ever private newspaper in Tanzania. Business Times also owns Majira, the Kiswahili leading newspaper in Tanzania. Installation of a trans-Indian Ocean backbone cable in 2009 has, in theory, made Internet access much more readily available in Dar in particular and in East Africa in general. However, roll-out to end-users is slow, partly because of spotty telephone line coverage, partly due to the substantial prices and long contracts demanded for purchase of bandwidth for small ISPs. Mobile-telephone access to the Internet via 3G and 3.75G is still relatively expensive. 4G is making its way through major cities and towns as of 2015 with plans to go countrywide in the advanced planning stages. Dar es Salaam is the city in Tanzania to which villagers flock for better opportunities. Westerners and Asians are also settling in Dar es Salaam, and the surge of foreigners has put pressure on local officials to develop policies better accommodating the growing diverse population of the city and its suburbs. Dar es Salaam is the educational centre of Tanzania. The city is home to educational institutions. The University of Dar es Salaam is the oldest and 2nd largest public university in Tanzania after the University of Dodoma. It is located in the western part of the city, occupying 1,625 acres (6.58 km2) on the observation hill, 13 km (8 mi) from the city centre. The university has 16,400 undergraduate and 2,700 postgraduate students. Ardhi University had 2,457 undergraduate and 156 postgraduate students in 2010/2011. The university offers two-year diploma programmes in land surveying and land management and valuation. A three-year diploma program in urban and rural planning has been introduced. Muhimbili University of Health and Allied Sciences has two campuses; Muhimbili Campus and Mloganzila Campus. Muhimbili Campus is situated in Ilala Municipality, in Upanga along United Nations Road. Mloganzila Campus occupies 3,800 acres (15 km2) and is located 3 km (2 mi) off Dar es Salaam-Morogoro highway, 25 km (16 mi) from Dar es Salaam. The Open University of Tanzania is a fully fledged and accredited public institution of higher learning, running programmes leading to certificates, diplomas, undergraduate and postgraduate qualifications. Since it was founded, the university has enrolled students from Malawi, Uganda, Kenya, Namibia, Hungary, Burundi, Libya, Ethiopia, Rwanda, Saudi Arabia, Lesotho, Botswana and most of Tanzania. As of 2008, the total enrollment at the university was 44,099, the majority of whom were Tanzanian. The Kampala International University—began operations in 2009 operating from Quality Plaza along Pugu road. The University Centre is situated on a 60 acres (240,000 m2) of land, at Gongo la Mboto area in Ilala District, 7 km (4 mi) from Mwalimu Julius Nyerere International Airport along Pugu road. Masaki, Oysterbay and Ada Estate are the high-income suburbs located along the central beach. During the Colonial Era, they were the major European suburbs of the city. Now diplomats and expatriates reside in these areas. Oysterbay Beach, also known as Coco Beach, is the only white sandy beach in Kinondoni and is the most famous in the area. Many luxury apartments line the waterfront, accommodating the rapid growth of foreigners, mostly Europeans and Asians. Mikocheni and Regent Estate are also suburbs within the district. According to the 2012 census, the Mikocheni ward had a population of 32,947. Mikocheni is the home of some political figures, including the first president of Tanzania, Julius K. Nyerere and opposition party leader, Freeman Mbowe. Mbezi Beach is the beachfront suburb located along the northern Dar es Salaam Beach. It is noted for its beautiful beaches with several tourist hotels, and also as the place of residence of people of high social status and some politicians. Sinza, Kijitonyama, Magomeni, Kinondoni and Mwenge are more ethnically mixed than the areas above. The wards also have the most prosperous business climate outside of the central business district, with shops, bars, restaurants and hotels located there. Kimara and Mbezi Louis are hilly, mostly upper class, suburbs far from the city. Due to the distance from the city center, it is quieter, with cooler weather. Manzese, Tandale, Mwananyamala-Kisiwani and Kigogo are considered low-income neighborhoods characterized by poor settlement planning, low quality housing and social services. Upanga & Kisutu had the highest concentration of Asian communities within Dar es Salaam, with residents of Indian and Arabian descent. These areas are also famous for the colonial houses and mansions built in Indian, Arabic and European styles. Kariakoo is the shopping district of the city, perhaps the busiest and largest in East Africa. Shops, bazaars and merchants dot the streets, selling products from foodstuffs to hardware materials. The Kariakoo Market, which is the largest, contains the only underground section of the city. 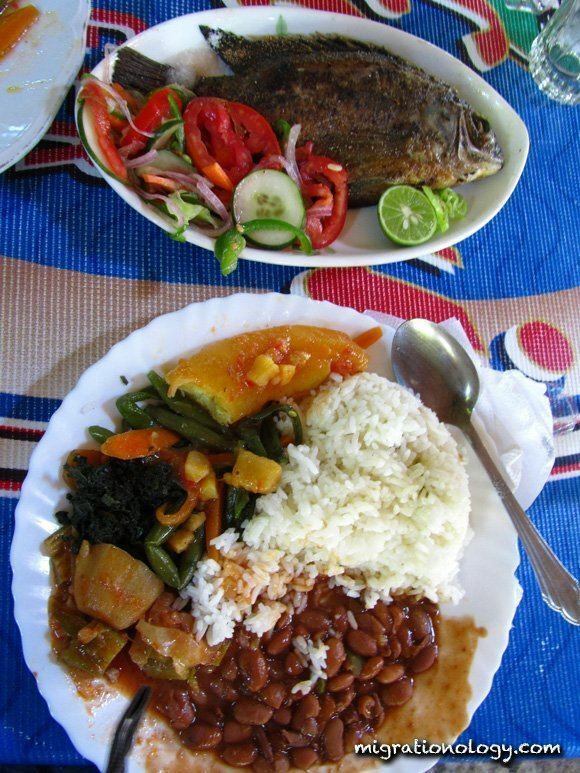 It is the major supply point of the food consumed by all the residents of Dar es Salaam. 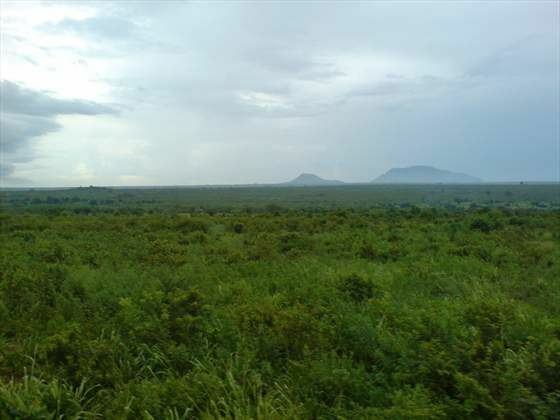 Tabata, Segerea and Ukonga are located a bit farther from the city center. They are growing to become among the busiest in terms of business and entertainment. This has caused serious traffic congestion, which is said to be the worst in all of Dar es Salaam. Ilala is among the middle income suburbs very near to the city center, and is marked by the Askari Monument. It contains some rival gang groups, whose activities include drug trafficking, money laundering, extortion and racketeering. Most famous gang groups are recognized by the color of their scarf (bandanna). These are the black gang, red gang and blue gang, fighting for control and to maintain their territories and interests. Temeke is the industrial district of the city, where the manufacturing centers (heavy and light industry) are located. The Port of Dar es Salaam, which is the largest in the country, is found here. Temeke is believed to have the largest concentration of low-income residents due to industry. Port officials, military and police officers live there. The Ubungo terminal is one of the main for the city and serves as a transportation link to most large Dar es salaam urban nodes. The Dar es Salaam commuter rail goes from here to the city centre but it is not fast(narrow gauge) and there are ten level crossings of roads along the route. Its also a hub of industry. Kigamboni (South Beach) is a beach front suburb on a peninsula with beautiful, sandy beaches. It is home to a mixed population of lower and higher incomes. There is demand from higher-income people to live in Kigamboni due to its low population density and proximity to the sea, but this demand is constrained by the area being mainly accessible by ferry involving long waiting times for those wishing to cross in a private vehicle, although crossing the ferry on foot or bicycle is quite quick. There are beach resorts in Kigamboni. Dar es Salaam is the sports center of Tanzania. Dar es Salaam hosts the second largest stadium in East and Central Africa (National Stadium), which can accommodate up to 60,000 people. The city is home of soccer clubs, the Azam FC, Simba Sports Club (Simba) and Young Africans Sports Club (Yanga) and other teams. Apart from the National Stadium, Dar es salaam is home to the Uhuru Stadium (used mainly for local tournaments and political gatherings), Karume Memorial Stadium (the home of Tanzania Football Federation (TFF)), the Gymkhana Golf Courses (between the city center and the shores of the Indian Ocean), and also has tennis courts, squash courts, and a Fitness club. Outside the metropolitan districts, there is the Lugalo Military Golf Course (located in the Lugalo Military Barracks). Kanyama Chiume, one of the main leaders in the independence struggle in Nyasaland (renamed Malawi after the country won independence) where he served as minister of education and then as minister of foreign affairs before going into exile in Tanzania, lived in Dar es Salaam for decades. He grew up in Tanganyika. He spent his childhood in Morogoro and in Dar es Salaam and attended primary school and secondary school in Tanganyika (later renamed Tanzania). When he was in boarding school in Dar es Salaam, he lived in the same dormitory with Rashidi Kawawa who later became vice president of Tanganyika, later Tanzania, after the country won independence. Kawawa was also his classmate at Tabora Secondary School (then known as Upper School). Chiume graduated from Makerere University College in Uganda and went to teach at Alliance Secondary School in Dodoma, Tanganyika. After he left Malawi in 1964 to go into exile in Tanzania (1964 - 1994), he went to live in Dar es Salaam again. He also worked in Dar es Salaam for many years as a journalist at The Nationalist, a newspaper of the ruling party TANU, together with Benjamin Mkapa who was then the editor and who later became president of Tanzania. Zakaria Maftah, LLB, [Rtd Police Commissioner], 1975-1990. Served the Anti Corruption Squad (ACS); his appointment announced on 15 January 1975, according to Government Notice No. 17 of 1975. With its establishment, the ACS took over the anti-corruption function that was hitherto carried out by the Police Force after the success of Geoffrey Sawaya (1973 - 1974) and Mr. S. Rutayangirwa (1974-1975). Zakaria Maftah was appointed by the former Tanzanian President, the late Mwalimu Julius Nyerere, after the establishment of the Anti-Corruption Squad (ACS) which lasted from 1975 - 1990. Respicius Rwehumbiza, a Tanzanian activist and author of several academic books and development materials. He has served as the executive director of the True Vision Tanzania (TVTA), a development Organization in Tanzania for several years. He also taught at a number of schools and universities including Feza boys’ high school and the University of Dar es salaam. Sai Grandhi, father of Freddie Mercury.